I want to start off by saying Merry Christmas to all — and by all I mean everyone, not just those who observe this Christian holiday. Christmas is a national holiday, a day dedicated to spending time with loved ones. This is something I believe to be true across religious affiliations as it is a value of human kind. We all have our traditions on this day and even I, a Jew on this great holy day, have partaken in many of the traditions connected to this holiday. Many of these traditions are put into place by one’s parents, as most holidays are used as an opportunity for families to understand and teach their children about their culture, history and moral values. As a Jew on Christmas, I never had a Christmas tree of my own to decorate. I never woke up to an exorbitant amount of gifts propped under a tree. My family celebrated the eight nights of Hannukah — several gifts a night and the traditional lighting of the menorah. Since there was very little to do on Christmas day with everything closed, we often celebrated Hannukah on Christmas, even if it didn’t fall on that day. We would go down to the city to my maternal grandparents’ apartment and celebrate with them. I remember the beautiful tree they had in their apartment building lobby and how it was decorated with candy canes ready for the taking. The Christmas spirit was strong, and I was happy to partake. That’s not to say that I didn’t take part in the other traditional ways to avoid this holiday. I’ve gone to the movies, I’ve gotten chinese food. There’s definitely nothing wrong with these traditions, but I’ve also gone to Christmas parties and even midnight mass. Over the years, our country has gotten so sensitive about our cultural differences. You can’t say Merry Christmas without someone getting offended, or being coerced into including Hannukah and Kwanzaa. You have the non-religious and anti-religious folks attempting to make a mockery out of the day. All of this colliding with our growing greed, this has become a consumer holiday for many. We have lost touch with what it’s really all about. Perhaps as Jew I am in an unique position to appreciate the moral values that this day represents. If someone says Merry Christmas to me, I say it back. I am not offended. I am happy to be part of a tradition, even on the periphery, that to me represents a day of kindness, generosity, and love. Yes, I am completely aware that it is still the summertime, and I would be the last person to try to make it end sooner, so pardon the topic of today’s post. But it has happened quite a few times over the last week — people bringing up the holidays to me. What are you going to do for the holidays as the first year as a married couple? Even my best friend said she didn’t want to spend the holidays with me because she didn’t want to “intrude”. To tell you the truth, this is clearly not one of the first thoughts in my mind — actually, it’s nowhere near the top of the list of things I’m concerned about after I get married. A lot of people have been saying to me “It’s different,” “you may want to start your own traditions,” and stuff like that. Well, I have a little story to tell you. My family and my fiance’s family are both very small. Both of our siblings have significant others who are from larger families, so what we have done for the holidays for the past several years is to bring together my parents and my fiance’s and celebrate just like that. In fact, if I remember correctly, the first time my parents met my fiance’s parents was on Christmas several years ago when we went to the diner together (the diner is of course where all Jews and non-religious folk flock in NY on Christmas). So when I was asked about this, I was really caught off guard. I mean, I’m getting married in October. Thanksgiving is just a month away. Do people really expect me to be ready to start creating new traditions in a month? And why do I have to? My best friend has spent holidays with me before, so why wouldn’t she now? Why would I exclude anybody from the dinner table during the holidays? Yes, I understand that it’s supposed to be special. Everything in the first year of marriage is supposed to be special. But the people who are special to me aren’t changing right now. I’m not having kids, my family is not really growing, because our families have been connected in this way for a few years. It will be special. I know it will be. I will be a wife. I get that. But I’m still me. And I will continue to welcome the people I love into my life any day of the year. When I want special husband and wife time, I will make it. My friends, my fiance’s family, my family, they are all already my family, so I will continue to keep them close for as long as they will have me. Married folk, feel free to tell me if I am missing something. ‘Tis the season to run up electric bills and build fire hazards, all with the intention of getting into the holiday spirit, a tradition that goes back centuries all across the world. Growing up Jewish, in an area where the population with split between Jews and Christians, it was always easy to tell who was who at this time of year. I never decorated my house with lights, never had a Christmas tree. I wasn’t crazy jealous of those who did, but I was always curious. I remember going down to my grandparents’ apartment on the upper east side and being mesmerized by the Christmas tree in their lobby, and the candy canes that decorated it. Anything that meant I received candy was a good thing. But Jews had gelt, and to me, chocolate will always trump mint. But really, it’s not a competition. So many of the traditions between so many cultures are so similar, it’s just interesting to see how people observe them. But I do have to say, there is a certain amount of excitement that you can’t deny when you see a beautifully decorated tree or a elaborately ornate home. I mean, millions of people literally travel to New York each December to see the tree at Rockefeller, and of course window shop. 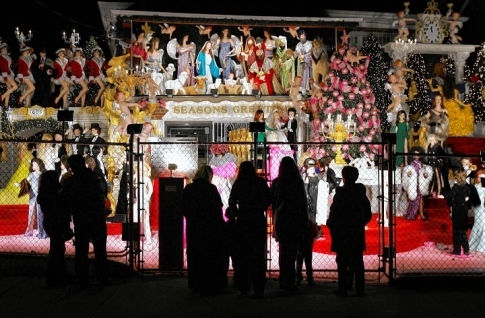 And in the Bronx, the Garabedian house has been causing traffic jams for years. The lights, these decorations, somehow enhance our imaginations, the excitement of the season. They help to create this atmosphere that the season is known for. It’s all about generosity, about togetherness, about hope. Even the Jewish holiday of Hannukah aligns with this image. Hannukah is the festival of lights. For eight days we celebrate miracles. So as I get older and start thinking about what I would want my children to experience, I would consider decking the halls of my home. I think it’s important to get into the spirit of the season, even if it isn’t your religion. The message is clear. Help those who are less fortunate than you. Enjoy the company of your loved ones. Be inspired by the miracles that happen around us, every day.